children and team at the Shaheeda Zainab School. I graduated with a B.Ed from Froebel College of Education and completed 3 years teaching in Ireland before moving overseas to the UAE. I taught for 4 years in Abu Dhabi and am very happy to be part of the team in Shaheeda Zainab School this year. Through my experience in the field of teaching, which began after graduating from my country Syria as a teacher of secondary school, and after I arrived in Ireland I started my journey in the field of Islamic studies when I graduated from the European Institute of Human Sciences, the Sharia & Quran Department, France, which was the key to my career with the Quran. And then I joined Al-Furqan Quran centre in dublin and got the certificate of the Nuraniah qualification from Alfurqan Quran Centre in Jeddah, Saudi Arabia and that started my career in Quran teaching. I was one of the teachers of the Center over the summer courses. I have experience in teaching Quran, Arabic language and Islamic education for more than three years as I'm a teacher at Noor Al Huda Quran School, which is the largest Quran school in Ireland. I had many different courses to improve my personal skills, such as childcare completed FETAC levels 3 / 4 and ECDL computer courses. 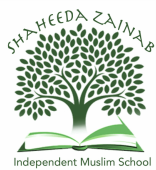 I am now with shuhada foundation for the third consecutive year and I am very happy to be part of a team at Shaheeda Zainab School. I graduated with a Bachelor of science from Punjab University in Pakistan and did a childcare diploma from Portobello College, Dublin. I have done a diploma in Islamic studies from Alhuda Institute in Canada and currently I am in third semester of my degree in Islamic Studies in Islamic Online University. I have received my Nuraniah certificate from Alfurqan last year. It has been a pleasure to be a part of the Shaheeda Zainab's team. Had living cert in 1977 been an Arabic and French primary school teacher from professional formation College. Starting as teacher in 1980 till 1993 (left the country). Same job in UAE. Also here for lybien school. Achieved the nuranya with the Cert from Jeddah. Teaching at Furkan Center. I hope to leave a great print at Shaheeda Zainab School.